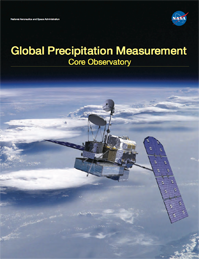 The Global Precipitation Measurement (GPM) mission is an international network of satellites that provide the next-generation global observations of rain and snow. Building upon the success of the Tropical Rainfall Measuring Mission (TRMM), the GPM concept centers on the deployment of a “Core” satellite carrying an advanced radar / radiometer system to measure precipitation from space and serve as a reference standard to unify precipitation measurements from a constellation of research and operational satellites. Through improved measurements of precipitation globally, the GPM mission is helping to advance our understanding of Earth's water and energy cycle, improve forecasting of extreme events that cause natural hazards and disasters, and extend current capabilities in using accurate and timely information of precipitation to directly benefit society. GPM, initiated by NASA and the Japan Aerospace Exploration Agency (JAXA) as a global successor to TRMM, comprises a consortium of international space agencies, including the Centre National d’Études Spatiales (CNES), the Indian Space Research Organization (ISRO), the National Oceanic and Atmospheric Administration (NOAA), the European Organization for the Exploitation of Meteorological Satellites (EUMETSAT), and others. The GPM Core Observatory launched on February 27th, 2014 at 1:37pm EST from Tanegashima Space Center, Japan. Learn more about the launch. The Tropical Rainfall Measuring Mission (TRMM), launched by NASA and JAXA in 1997, used both active and passive microwave instruments to measure rainfall in the tropics. It also provided a foundation for merging rainfall information from other satellites. TRMM has shown the importance of taking observations from a non-Sun-synchronous orbit at different times of the day, between observations by polar orbiting sensors at fixed times of the day, to improve near real-time monitoring of hurricanes and accurate estimation of time-accumulation of rain volume. The GPM Core Observatory continues this sampling from a non-Sun-synchronous orbit and extends coverage to higher latitudes to provide a global view of precipitation. The GPM Core Observatory design is an extension of TRMM’s highly successful rain-sensing package, which focused primarily on heavy to moderate rain over tropical and subtropical oceans. Since light rain and falling snow account for significant fractions of precipitation occurrences in middle and high latitudes, a key advancement of GPM over TRMM is the extended capability to measure light rain (< 0.5 mm hr-1), solid precipitation and the microphysical properties of precipitating particles. This capability drives the designs of both the active and passive microwave instruments on GPM. The Core Observatory acts as a reference standard for the precipitation estimates acquired by the GPM constellation of sensors. 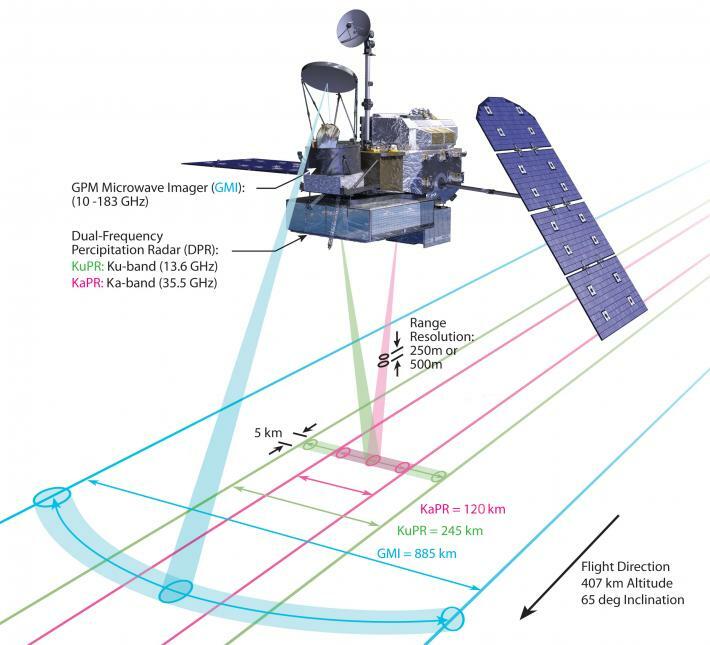 The GPM Core Observatory carries the first space-borne Ku/Ka-band Dual-frequency Precipitation Radar (DPR) and a multi-channel GPM Microwave Imager (GMI). The DPR instrument, which provides three dimensional measurements of precipitation structure over 78 and 152 mile (125 and 245 km) swaths, consists of a Ka-band precipitation radar (KaPR) operating at 35.5 GHz and a Ku-band precipitation radar (KuPR) operating at 13.6 GHz. Relative to the TRMM precipitation radar, the DPR is more sensitive to light rain rates and snowfall. In addition, simultaneous measurements by the overlapping of Ka/Ku-bands of the DPR can provide new information on particle drop size distributions over moderate precipitation intensities. In addition, by providing new microphysical measurements from the DPR to complement cloud and aerosol observations, GPM is expected to provide further insights into how precipitation processes may be affected by human activities. The GMI instrument is a conical-scanning multi-channel microwave radiometer covering a swath of 550 miles (885 km) with thirteen channels ranging in frequency from 10 GHz to 183 GHz. The GMI uses a set of frequencies that have been optimized over the past two decades to retrieve heavy, moderate and light precipitation using the polarization difference at each channel as an indicator of the optical thickness and water content. Improved forecasting abilities for natural hazards, including floods, droughts and landslides. Learn more about GPM's science objectives. Learn more about GPM's applications.